Our industrial flooring products are color stable, allowing it to take in UV exposure without damaging the shine, gloss, or overall color. Unfortunately, color loss can sometimes be a common problem with many other coating systems (such as some epoxies). 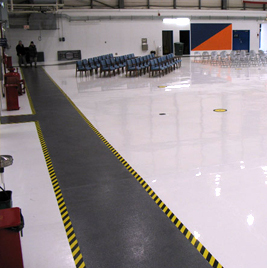 Our Polyaspartic applications are ideal for many industrial flooring projects. Polished concrete applications are “GREEN” and have become very popular. Carolina Coatings & Tile, Inc. will provide High Quality Polished Concrete applications… polished up to 3000 grit (High Gloss) over stain or clear concrete substrate applications. Please view our commercial, residential, and industrial flooring photo gallery to see some of the local protective flooring projects we have completed. And contact us today to schedule an appointment. Carolina Coatings and Tile, Inc. is a North Carolina Leader in residential and commercial epoxy and protective flooring solutions and customized ceramic, marble, stone and mosaic tile. We specialize in a wide variety of projects from small-scale residential basement flooring to large-scale commercial aircraft hangar applications.Located in Raleigh NC, Carolina Coatings and Tile completes residential and commercial projects throughout North Carolina, Virginia, South Carolina and Georgia.© 2016 Carolina Coatings & Tile, Inc. All Rights Reserved.